For the first 128 years of our country's history, not a single woman served in the Senate or House of Representatives. All of that changed, however, in November 1916, when Jeannette Rankin of Montana became the first woman elected to Congress—even before the Nineteenth Amendment gave women across the U.S. the right to vote. 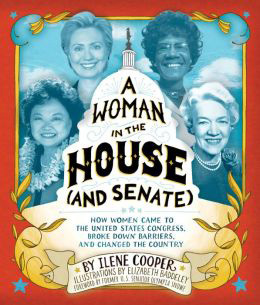 Beginning with the women's suffrage movement and going all the way through the results of the 2012 election, Ilene Cooper deftly covers more than a century of U.S. history in order to highlight the influential and diverse group of female leaders who opened doors for women in politics as well as the nation as a whole. Featured women include Hattie Caraway (the first woman elected to the Senate), Patsy Mink (the first woman of color to serve in Congress), Shirley Chisholm (the first African-American woman in Congress), and present-day powerhouses like Nancy Pelosi and Hillary Clinton. The book is filled with lively illustrations and archival photographs. It includes a glossary, index, and chart of all the women who have served in Congress.